Johannes Lichtman discusses his new novel, Such Good Work. Jonas Anderson might be an excellent teacher if he weren’t addicted to drugs. Instead, at age twenty-eight, he’s been fired from yet another creative writing position after assigning homework like, visit a stranger’s funeral and write about it. Jonas needs to do something drastic and, as a dual American-Swedish citizen, he knows Sweden is an easy place to be a graduate student and a difficult place to be a drug addict. The year is 2015 when he arrives in Malmö, a city trying to cope with the arrival of tens of thousands of Middle Eastern refugees. Driven by an existential need to “do good,” Jonas volunteers with an organization that teaches Swedish to the desperate and idling young refugees. But one young man, Aziz, will force Jonas to question whether “doing good” can actually help another person. Such Good Work is a darkly funny work of autofiction that asks us to consider how one should go about being a good person in our modern world. 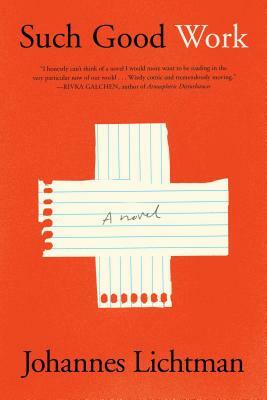 In his striking debut novel, Johannes Lichtman’s uses pathos and humor to grapple with simple yet necessary questions—Such Good Work begs you to consider the person you are, as well as the person you hope to be.